Mobile carrier KT said Friday that it had built an internet of things-based electric bicycle in partnership with bicycle maker Recon Hi-Tech. Dubbed “Air i,” the electric bicycle uses IoT technologies to reduce the risk of loss or theft. KT applied its IoT technologies and smart mobility platform to the bicycle in order to connect it to the company’s LTE-M network, allowing users to keep track of the bicycle’s real-time positions and remotely control operations. According to data from the Ministry of the Interior and Safety, around 30 bicycles are reported missing daily and around 20,000 bicycles per year. Through the remote control system built by KT and Recon, Air i owners will be able to prevent the loss of their bicycles and also stop them from being resold illegally by temporarily halting the motors of stolen bicycles. 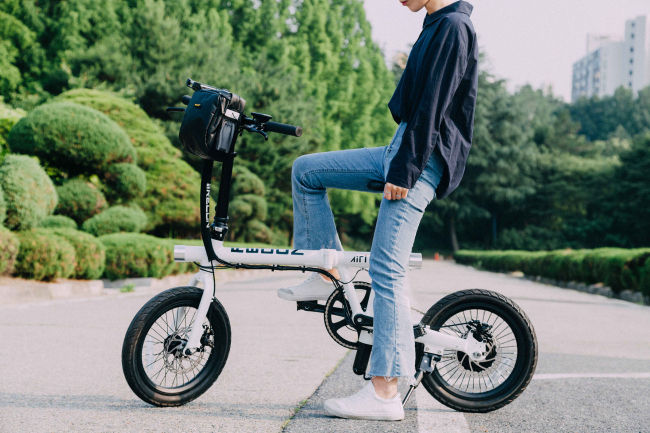 The foldable, 15-kilogram Air i is suitable for public transportation mobility and can run for up to 60 kilometers when fully charged. Recon Hi-Tech plans to build up its IoT and big data capabilities, to boost the smart mobility market, said its CEO Kim Jin.